So just how familiar is middleweight contender Peter Quillin with Craig McEwan, whom he faces this Saturday night in Cancun, Mexicoas the opening bout on the latest installment of HBO’s “Boxing After Dark”? 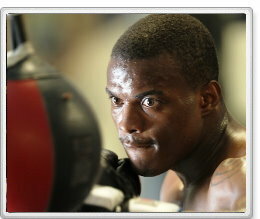 2009 was a lost year for Quillin as he battled an injury to his right hand, appendicitis and fractured orbital bone. Quillin says there is no extra pressure to impress on this platform. “No, I'm just going to go up in there and be ‘Kid Chocolate,’ do what I usually, normally do which got me here on HBO,” he said. It would certainly help. Recent history has shown that sometimes just merely winning isn't enough on this stage. Yes, style points matter- ask Vanes Martirosyan, who was expunged from HBO's airwaves after his win over Joe Greene last June- but just getting back on HBO is not the goal. At age 28, he's in his physical prime but because of the time lost and the lack of a real strong résumé, he was considered a bit too green and not worthy of facing middleweight champion Sergio Martinez in his last outing. But perhaps facing Martinez down the line is more ideal. Timing is everything in life and perhaps the time is now for Quillin to begin this ascent.